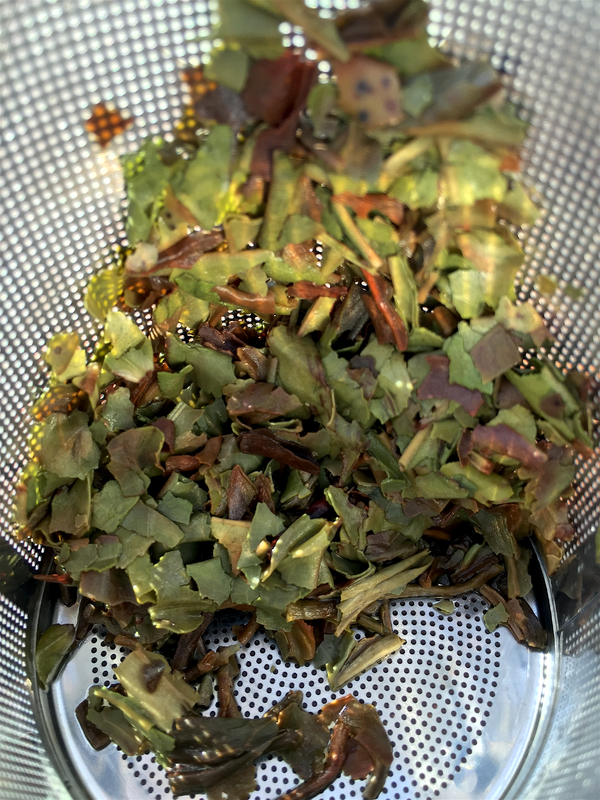 It’s been a few months since I wrote on the Simpson & Vail Incursion, but as you can see from the reviews I’ve pulled together so far, their teas haven’t failed to impress (I especially liked Emerald Green Tea Organic 1st Flush). As such, I’ve been excited to try the other Nepal tea I’d procured from S&V: Sakhira Estate 1st Flush. As you probably know by now Nepal is home some of the most amazing high grown Black and Green teas. Rated at SFTGFOP1 Tippy and with an abundance of Green in the loose leaf mix, Sakhira Estate 1st Flush definitely caught my eye. In reviewing my lab shots for Sakhira Estate 1st Flush my socks were about knocked off by how gorgeous its loose leaves are. ;) Check out the images below: I’m particularly proud of the spent leaves shot from inside the infuser basket (I’m have no idea how i pulled this off, please don’t expect it to be a daily feature ^^;;). I was on the verge of saving the remainder of the loose leaf for later enjoyment, but realistically i know i’d never get back to it before it died. Don’t follow my example; tea doesn’t come that cheap. ^^;; My method for steeping a tea once or twice and tossing it is really only useful for my blogging (and pursuing the crazy challenge of sampling as many of the world’s ~20,000 teas as i can before i die). All around, a simply stellar tea. Sakhira Estate 1st Flush (S&V) ~ loose leaf by Jocilyn Mors is licensed under a Creative Commons Attribution-ShareAlike 4.0 International License. Sakhira Estate 1st Flush (S&V) ~ loose leaf macro A by Jocilyn Mors is licensed under a Creative Commons Attribution-ShareAlike 4.0 International License. Sakhira Estate 1st Flush (S&V) ~ spent by Jocilyn Mors is licensed under a Creative Commons Attribution-ShareAlike 4.0 International License. Sakhira Estate 1st Flush (S&V) ~ liquor by Jocilyn Mors is licensed under a Creative Commons Attribution-ShareAlike 4.0 International License.